You difficultly made it up to the semi finals. I let me guard down way too much once the score became 2-0 that I allowed him to make a comeback and tie up the score at 2-2. I did focus for the final game but I messed up my battles and thought that I was going to lose. But then my opponent rushed his attack and I was able win through luck. In the beginning, you had a 2-0 lead. I got lucky for game two. I should have lost 1-3 to be honest. I felt really good once the score became 2-0 but I let my guard down and almost allowed a reverse sweep. You say that you let your guard down but why did you continuously chase him? I wanted to end it quickly so I kept bringing him aggression. But then I ended up putting myself in to disadvantageous situations as my attacks kept getting blocked. Game five was also a rather difficult victory. What was the cause of that? I fought with my mutalisks way too many times without really thinking through. I kept allowing them to get fungaled without being able to utilize them. And then afterwards I started to feel like I was going to lose because I just kept fighting with them in the strangest ways. As I previously stated, I won because my opponent rushed his attacks. I got lucky. Your next opponent is Leenock. You have to play yet another ZvZ. Honestly, I really don't like ZvZs. I usually don't lose in any other match up but I feel burdened by the fact that it's a ZvZ. But since my opponent is Leenock hyung I am going to try to make sure I win no matter what. 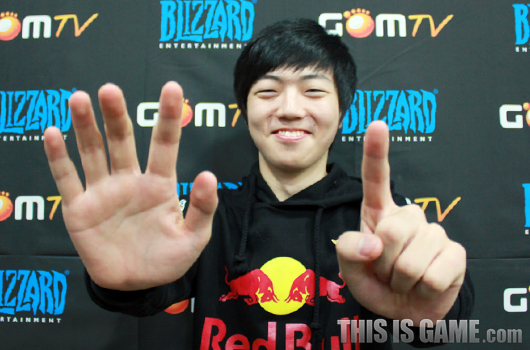 Most recently you lost to Leenock at IPL5 by a score of 0-2. I think I'm going to grab my revenge this time around. When I was playing at IPL, I didn't know how to approach my battles for ZvZ. But then afterwards, the coach taught me some secrets regarding ZvZ battles. What do you think the semi finals score will be? I'm going to win 3-0. I am confident. You are a nominee for the newcomer award for the end of the year award ceremonies. Do you want it? Right now I really do want that award. I am going to be really happy if I am able to grab that award. I want to thank my coach for helping me out with my ZvZs. I want to thank the fans for cheering me on and the manager and coach for accompanying me to the studio today. 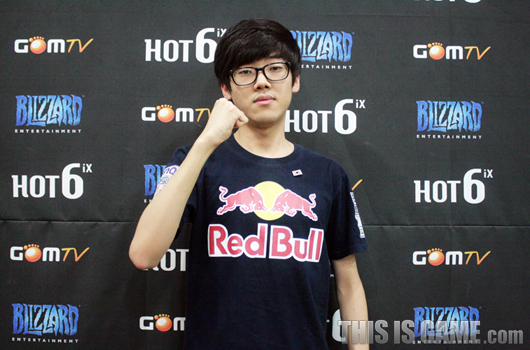 I want to thank Curious hyung for helping me with practice and our sponsors Red Bull, ZOWIE Gear, and Joy Gear. After a dramatic victory, you advanced to the semi finals. Up till this point, every player that I defeated was someone that I had to grab revenge against. Mvp hyung, DRG hyung, and viOLet hyung was also someone I needed to grab revenge against. I am glad that I was able to beat everyone that I needed to grab revenge against. It was difficult sure, but I am even more glad that I was able to really fun games against them. You started off with a 1-0 lead but then how did you feel after losing two games in a row? Honestly, game one was a very easy victory for me but I made too many mistakes for game two. I let me guard down and I wasted away my units. I was most disappointed about game two. If I had just played patiently, I could have won game three as well. I was originally expecting a 3-0, but oh well. Was the fast mothership strategy for game four a planned out one? That was a strategy that I have always wanted to use and I finally got the chance to today. In order to earn the support of the 300,000 Protoss players in this world I gathered every single Protoss user's strength. Which is why I named this build order, "the Spirit Bomb". (LOL @ DRAGON BALL Z REFERENCE) It ended up working just like I thought it would. Honestly, I got goose bumps once I queued the mothership. I felt a little anxious once my mothership died because originally, it wasn't supposed to die. Game five was also a difficult victory. Around when did you realize that you had won? I didn't feel anxious but rather felt confident. I thought to myself that I had won as I went in for the final attack but I kept on worrying about making the same mistake that I did against DRG hyung. I was able to focus well however because I remembered back to the time when I was immature and ended up making that mistake. You are the only Protoss in the semi finals. Isn't that burdensome? Honestly, I am lonely since I am the only Protoss user and there aren't even any Terrans. But then I look at it from another angle and I see it as a good thing. It's a chance for me to get even more attention and I can put to peace all these notions that I am horrible at PvZ. I thought that it was really unfair that I was known as an all iner and that I never got to show my best form. So I practiced really hard on my PvZ so that I could grab my victories through macro. Lately, your immortal all ins have been getting blocked pretty often. Has the effect worn off or do you just not have enough soul? There is no such thing as an invincible build. I never thought to myself that this build was fool proof so I strategized with Squirtle hyung a lot because I knew that there was still a lot of room left for Protoss to grow as I practiced really hard. The immortal all in build order has reached its maximum potential. While it's true that my version of the build order is still the strongest, the top Zerg players can all block it. What do you think your semi final score is going to be? I lost to Sniper in the last season of Code S Ro16 by a score of 0-2. Back then, I had no patience. Of all the Zergs that I know of, I consider Sniper to be the best. Regardless of who wins I am expecting a 3-2 score and that the match will be really fun. I want to thank my Zerg teammates, Curious hyung, SoN, and even though he didn't help me with practice, he still cheered me on and told me that I was going to win, so Life. And I dedicate today's victory to Squirtle hyung in his honor. I want to thank my mom for cheering me on and want to let her know that I love her. Lastly, I want to thank our sponsors Red Bull, ZOWIE Gear, and Joy Gear. seeker you are the best. I really appreciate all the translations youve been doing gogogogo seeker. I love how confident Life is, feel bad for DRG though messes up his chance to insta ro4 and then loses in his ro6 match. Feels good to know I was one of the people that helped power the spirit bomb. What do humans know of our pain? We have sung songs of lament since before your ancestors crawled on their bellies from the sea. LOL the spirit bomb, Parting why so epic! seeker ftw ! thanks ! parting y u so epic ? best interview ever ! PartinG's interviews just get better and better every time, It's scary. Soulful Spirit Bomb is the key to victory I guess. I hope you make it to the finals PartinG since that's the only thing I'm going to watch in this tournament, mostly for the award ceremony and the hots show match. The Spirit Bomb. That was so awesome. Parting should win an award for best interviews this year.